The best supporting role any movie production could ask for: new title animations. Make a solid impression right at the start of each movie. Because quality is all that matters. This is biggest performance update yet – experience your films in never seen before image quality! With custom sorting for tracks, color grouping and accurate importing of objects, you're ready to take on even bigger projects. A quantum leap in processing performance: Turn your footage into finished movies even faster with INTEL support and AVX optimizations. Accelerate your editing workflow: Editing templates for automatic video editing. Since they're so popular, we've added new templates with 25 fresh soundtracks to the Store. A legend, a head-turner and a class act. 3 high-quality plug-ins designed to make your movies fit for the big screen. Only available in the Premium version. Entertainment from start to finish. Make movies that impress right from the start — with all-new title animations. And keep the suspense turned up all the way to the end with an extensive selection of effects. No other feature has been requested as frequently by the Movie Edit Pro community as new title templates. And now they're here: custom titles. Individually animated. Letter by letter. Programmed to impress. Keep your audience on the edge of their seats right to the end. 1,500 effects — 1,500 ways to impress. Sound is every bit as important as image. Movie Edit Pro now features an amazing selection of movie music and sound effects you can use to bring your visuals to life. An expedition to Everest, ending with you at the summit? The new chroma keying feature makes it all possible — and incredibly easy. Movie Edit Pro is with you every step of the way. Precise cutting tools react to your command to modify everything the way you want. It's a new smoother, faster video editing workflow. Activate a destination track. Insert videos, effects and music to the exact position you want in the Timeline. All this can be done easily using copy & paste. This helps you save a ton of time when working on video projects. Your movie — just like you imagined. Experience the freedom of being able to rearrange, delete and completely reorder your tracks any way you want, whenever you want. Even retrospectively! The new version features a completely redesigned effects area to give you a better overview of the effects and the freedom to customize how you work with them. Plug-in dialogs let you preview your movie as you apply effects. Grouped, yet with enough freedom: The new, flexible grouping options for video and audio tracks. The new J-L cut – an impressive time-saver for overlapping objects, for example, in documentaries with narration lasting several scenes. Move object contents instead of cutting! We're revolutionizing video editing, so that your film is finished faster. Find the right scenes by intuitively scrubbing through footage – directly in the corresponding video object. 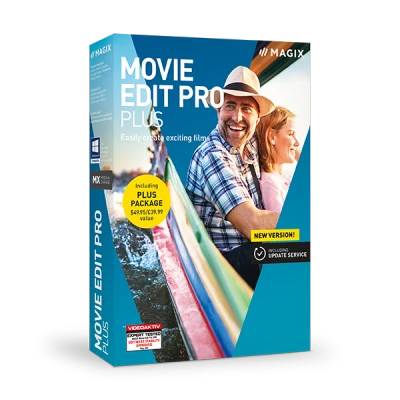 Movie Edit Pro now features the same power as its big brother, MAGIX Video Pro X. For improved performance you can feel. You'll notice the difference in image quality right away. 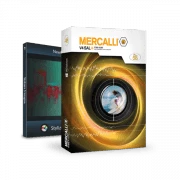 With significantly faster video processing and award-winning program stability. Full quality during recording and in your final movie! Your 4K footage now contains fewer visible artifacts and Moiré patterns when exported as FullHD video. Switch up a gear: INTEL GPU hardware acceleration is now activated for export. Made possible by our partnership with INTEL. Let Movie Edit Pro take the reins. Sometimes you need to finish a film fast. Select music – add a title – and Movie Edit Pro does all the editing work for you. 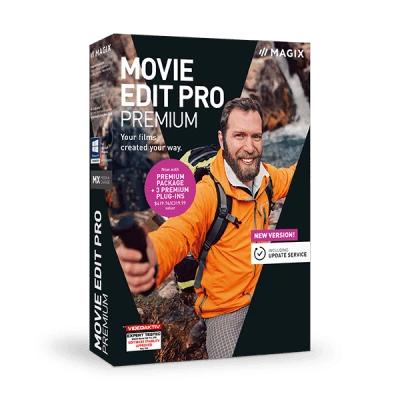 Movie Edit Pro is easy and fast to use – that's why it's popular with so many users. In addition, there's now 25 new editing templates in the Store. Don't miss your chance – discover them now! Get the new complete effects package for your travel videos. From hand-drawn travel maps, and country-themed intros/outros to smaller playful details such as suitcase stickers, postcards or decorative elements – over 350 effects are included for creating the perfect video of your travels. Note: Premium version plug-ins are included upon purchase of new software or extension of the Update Service, or when you upgrade. Program language for all plug-ins is English. Note: Premium version plug-ins are included upon purchase of new software or extension of the Update Service, or when you upgrade. Program language for "HitFilm Ignite Color: Cine" is English.